The topographical detail of our environment and surroundings is constantly changing, particularly in fast developing urban areas or in the case of a humanitarian emergency. The global community at OpenStreetMap and Humanitarian OpenStreetMap Team use citizen generated data (in the form of community mapping) to help shine a free light on the least charted quarters of the world. Maps connect, tell stories, help communities plan, document evidence and inspire change. OpenStreetMap (OSM) is used for navigation, recreation, civic engagement and humanitarian or emergency response. OSM has a global community of over one million contributors who help create a free, editable map of the whole world. This map and all its data has an open-content license, and OSM data is contained in regularly updated files called ‘planet’. As of October 2015, OpenStreetMap planet data is available in one file with XML variant over 617GB uncompressed, 44.7GB bz2 compressed and 29.3GB PBF. 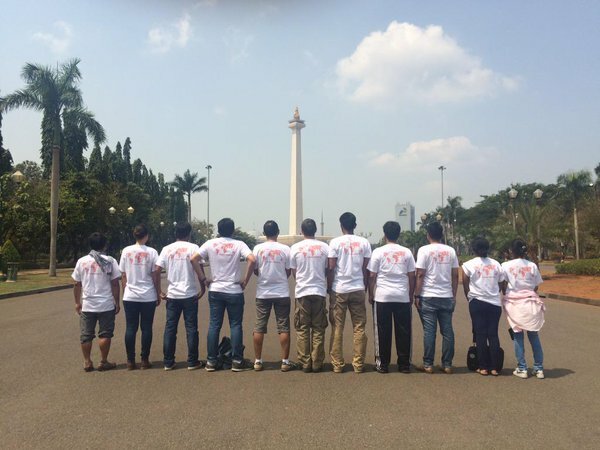 The Humanitarian OpenStreetMap Team (HOT) is a community and organisation that applies OSM’s principles of open source and open data sharing to humanitarian response and economic development. HOT has delivered and supported projects around the world, as well as mobilising its community for large scale emergencies. The largest HOT activation was in April 2015, following a 7.8 magnitude earthquake that struck Nepal, close to the capital city of Kathmandu. The earthquake killed thousands, injured many and devastated the local infrastructure. HOT’s local and global communities were ready to help. In disaster risk areas such as Nepal, community resilience and a working knowledge of open data tools like OSM have become part of the overall crisis management strategy. In this case, the local OSM community, led by non-profit tech company Kathmandu Living Labs (KLL), had been hosting training workshops and building partnerships with governments, universities and civil society groups for a few years prior to 2015. More than 7500 mappers worked day and night to improve the existing map for responders. The HOT Activation Team and KLL worked with partners to obtain and process free imagery (pre and post-disaster imagery), train and validate map efforts as well as managing the steady stream of new contributors. KLL coordinated mapathon events on five continents: Europe, Africa, North America, South America and Asia, advising mappers on areas to prioritise. Emergency aid groups including those from Nepal Civil Defense, Canadian Forces, American and Nepal Red Cross used the up-to-date maps produced by the worldwide OSM community to help plan their response on the ground. Existing communities that provide more technical mapping support made it possible to obtain various map products (print or digital). The Japanese community also translated the Nepal OSM Building guide into Japanese. Open data from open maps can make a difference in the world. There are a number of ways to collect and use data for OpenStreetMap, using satellite or aerial imagery or field papers. Field Papers is an online tool created by Stamen Designs that makes it easy for anyone to print a map and collect new data. 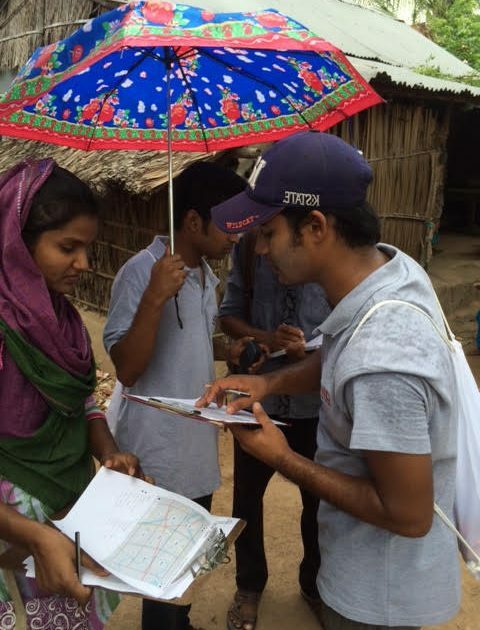 The students pictured below are working to map their community, as part of OSM Bangladesh. Great mapping projects often require a comfortable pair of shoes, paper, a map and pens. HOT and OSM receive satellite imagery from a number of providers 1To learn more about satellite imagery here is a basic primer from the World Bank: http://satsummit.github.io/landscape/. Microsoft’s search engine Bing donated imagery to OSM, so this can always be used for any remote mapping. HOT receives donations of pre and post disaster imagery to aid in the mapping efforts. However, satellite imagery sometimes has clouds or is not clear enough to trace map data. To help, HOT and Development Seed created a project called OpenAerialMap, funded by the Humanitarian Innovation Fund. The goal of this project is to make it easy for people to publish and share any aerial imagery in an open licence. Once the data is collected, it can be uploaded and edited in the live map. Live map edits involve tracing the lines and tagging information according to a standard OSM taxonomy. For those new to OSM, there are editing tools and help guides. For example, HOT created the step by step guide LearnOSM, which has translations in multiple languages. You can find MapGive instruction videos online and there are many other how-to resources available, such as those created by the OSM Japan Foundation. How can maps and citizen-generated data empower civil society organisations to bring about change in their local community? In some parts of the world, existing physical layer maps are inaccurate and outdated. Imagine walking around your neighbourhood – do you know the names of all the streets, or where the nearest school or hospital is? With this kind of data, people are in a better position to plan futures for their communities. OSM enables each of these data items to be downloaded freely, making it a valuable civil society resource. In Dar es Salaam, one of the fastest growing cities in East Africa, maps of the urban area are regularly in need of updates. For Juliana Letara, municipal town planner for Kinondoni Municipal Council, Dar es Salaam, community mapping is key. Letara is part of a Tanzania community mapping project, Ramani Huria2About Ramani Huria (http://ramanihuria.org/): HOT is the training partner of this larger project. Partners include schools: Ardhi University (http://www.aru.ac.tz), University of Dar es Salaam (http://udsm.ac.tz), COSTECH. http://costech.or.tz, supported by the Tanzanian Commission for Science and Technology, the World Bank and Red Cross., an initiative focused on flood resilience. Alongside local students, Letara has learned how to collect data to create maps for community development. Community created maps, Letara advises, can help her better plan for the community’s future. Nothing trumps local language, culture and knowledge when it comes to community mapping – the best data is locally produced. Without local citizen engagement and ownership, Letara would be working with poorer quality maps and her development work would be impeded. On the OSM website you can see data that Julia and her team collected in Dar es Salaam. Now anyone can use this imagery for their civil society work in the region. In a world where citizen-generated data is routinely used in civic processes, every town will have leaders like Julia who use OSM as part of their data toolkit. “Community mapping makes the data come alive,” said Dr. Chung-Ping (Joesph) Yang, at a recent State of the Map OSM workshop in Taiwan. Yang said that the OSM community mapping workshop helped his students to have a better understanding of their surroundings and their country. While HOT is focused on disaster resilience, OpenStreetMap (the large dataset) has potential for many other sorts of data-driven projects. The key to success with all these citizen-generated data initiatives lies in involving the local community, building a strong plan and learning some best practice tools and techniques.